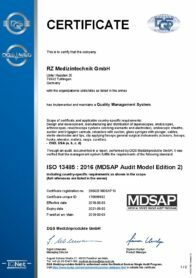 Compliance with legislative provisions and standards, and with in-house corporate requirements, are self-evident matters for RZ Medizintechnik. 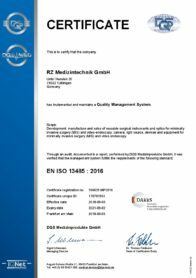 RZ Medizintechnik has a certified quality management system that complies with the DIN EN ISO 13485:2016 standard. 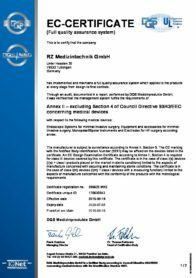 We also satisfy the requirements of EC Directive 93/42/EEC for medical products as well as other national and international directives.